Some years ago a group of men from my parish were providing escorts and security for an all-night Eucharistic Adoration vigil for life. I drew one of the wee hours. My relief didn’t show up, so I stayed on for some more hours. I brought with me a little book: The Ways of God by Thomas Aquinas (1995, Sophia Institute Press). There are short chapters on 22 attributes of God and meditations on how we should imitate these attributes in our own lives. As I prayed with this little book through the night, I found myself especially meditating on how these attributes of God could be applied specifically in my life in my role as a father. As fathers, we are blessed to have the very name that Christ told us to call God in Heaven: Father. However, that blessing comes with a great responsibility. Due to the power of association, our children first experience God’s fatherhood through our fatherhood. If we want to introduce God to our children positively, then we must reflect His ways in our relations with our children. In some senses, our behavior will impact the way our children think of God, for good or for bad, simply because of our name and authority that comes with it. For example, in matters of discipline fathers need to reflect on whether they practice a balance of justice and mercy or favor one over the other. A father who is strong in justice, overbearing in punishment and short on mercy may unwittingly image to his child a god short on mercy, heavy on punishment, or simply a god who is overbearing and to be feared (not in the same sense as the gift of the Holy Spirit-Fear of the Lord) But our God is overflowing with mercy and ready to forgive. Oh yes, Hell exists! But Hell is the choice of men who will not love God over themselves. On the other hand, a father who is so “merciful” he can’t bear to punish his child’s misdeeds is also doing disservice to the child and teaching a wrong lesson about life and about God. In truth, justice and mercy must go hand in hand. So, for example, we can ask ourselves: Do the punishments we administer to our children reflect the natural consequences (and choice) of the particular bad behavior being punished? This coupled with our mercy, that is, ready forgiveness offered to our children may more accurately reflect how God relates to man’s sinfulness than whatever we have been doing in the past. I recall that the First Communion (Baltimore) Catechism tells us that we belong to God not to our parents. We don’t own our children. 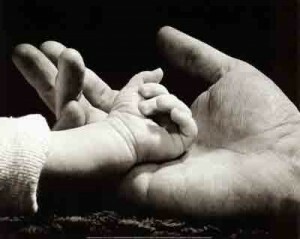 As parents we take the place of God in raising and caring for them, and in teaching them the ways of God. How better to teach than by example. Every parent can testify that children are great imitators especially it seems of our faults, and especially in public. St. Thomas Aquinas notes (in The Ways of God) that we should “model ourselves” on our Creator in his attributes and imitate Christ in His actions. This advice is worth thinking about for a few minutes and revisiting every evening to see how we are doing. In the following weeks, I will share the notes I took on The Ways of God which came to me in prayer that night and on days hence. In many senses they reflect my own struggle to be a worthy father to my children-at least at that moment in time. Each article begins with a short outline on how St. Thomas Aquinas defines each attribute of God and continues with reflection on we can apply St. Thomas’ suggestion to our vocation as a father. Oremus pro invicem! – Let us pray for each other! Jim Curley writes frequently about Catholic life, culture, and other topics on his blog at http://bethunecatholic.blogspot.com. He and his wife Lorelei have 7 children, and together they raise hogs, milk cows, grow peanuts and homeschool in rural <?xml:namespace prefix = st1 ns = "urn:schemas-microsoft-com:office:smarttags" />South Carolina.